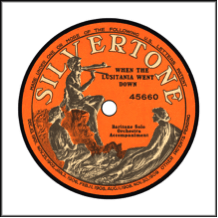 Silvertone records would replace the Oxford line of records in 1916. These early Silvertone records had an orange background and were produced and pressed by Columbia Records. In 1917, Silvertone changed the label background to purple with block lettering. However, one year later, in 1918 Sears would discontinue the Silvertone line. Though, it would re-emerge in 1919 with a new silver and blue label. These labels were produced and pressed by Federal Records. After a fire at the plant, Sears would create a new tan label in the early/mid 1920s and use many suppliers including Columbia, Starr, Brunswick, Emerson, and Pathe. These tan labels contain rare anonymous recordings. Silvertone would be discontinued again in mid-1928. Sears would eventually replace the Silvertone label with a Supertone label (produced and pressed by Starr Piano Company) in the 1930s. Silvertone would re-emerge as a label for Sears in 1940 and be discontinued one year later, in 1941. The 1940-1941 Silvertone was produced and pressed by Columbia Record Corporation. Silvertone would come back one last time in 1950. These were red vinylite pressings produced, this time, by Mercury Records. Sears would go on to produce the Challenge budget record label from 1926-1930 and a more expensive line called Conqueror from 1928-1942. Most of the records made for Sears were duplicate recordings, reprints of existing catalog numbers, or anonymous recordings. Some of records produced for Sears under the Silvertone label were alternate recordings. These are especially rare and valuable. Music Genres: Band, Waltz, Orchestra, Band, Jazz, Blues. Pre-1941 Labels: Orange, purple, tan, or blue in color. Silvertone in block or scripted lettering. Image of a piper with a two-person audience or just the piper appeared on pre-1920 labels. Silvertone 1916. Orange background. Made by Columbia Records. While not on the Silvertone label: When the Lusitania Went Down, 1915. Silvertone’s Tan Label. Made in 1923 or 1924. Made by a variety of different manufactures. 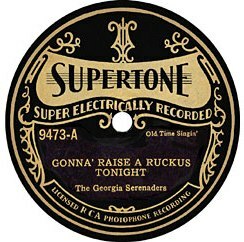 World War II Label: Scripted lettering and a blue background with the piper image replaced with an SR (Sears and Roebuck) logo at the top. Silvertone 1940-1941.Brought back by Sears. Mainly produced by Columbia. Post World War II Label: Scripted blue lettering on a white background. Silvertone Post-WW2 1950. Produced by Mercury for Sears on red vinyl. As an example of what the post-WW2 Silvertone sounds like: Stardust by Glenn Osser in 1950. Numbers from start to 1945: #200-25000.